Dukla, a town with a long history in the Hungarian wine trade, and also known locally for brewing beer, continues this tradition with its own fine brewery in modern times. The brewery was established in 2014 because of the passion and resoluteness of local people with a taste for good beer. The first vat was brewed in January 2015, and today the brewery already has several dozen beers on offer in various styles and flavours. Browar Dukla, established at the foot of the magical Mount Cergowa, has become the pride of the town, and a great attraction of the central part of the Low Beskid. Just in the first year of operation it had great success at the Poznań Beer Expo, where it was awarded two medals. A silver medal was awarded for Szalony Alchemik, an American India Pale Ale, and a bronze medal for Mała Czarna stout. In 2016 the brewery was again awarded a silver medal for its brown porter, Nafciarz Dukielski. In a way, it was inspired by the oil drilling which started on an industrial scale in the Dukla region about 150 years ago. To quote the creators of this unique beverage, Nafciarz Dukielski is “a beer with an oily texture coming from dark-brown rye malt, enriched with chocolate and roasted whisky malts. Its flavour and aroma combine peat and oil characters with the noble herbiness of hops”. The Dukla Brewery also offers other beers: Miss Lata (Summer Ale), Tajemniczy Jeździec (Session IPA), Dziki Samotnik (American Amber Ale), Dębowa Panienka (grodziskie style), Piękna Nieznajoma (American Pale Ale), Nieproszony Gość (Czech pils), Ostatni Sprawiedliwy (wheat), Dziedzic Pruski and Bawidamek. 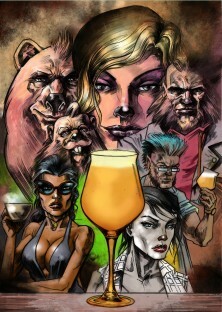 The originality and uniqueness of the local beers is emphasized by the unusual labels referring to a classic comic format designed by Krzysztof Brynecki, a cartoonist from Krosno. It adds an interesting, fancy character to the beer and the brewery. In a nutshell, the Dukla Brewery integrates tradition with modernity. The beers are available in a pub by the market square in Dukla, the Tawerna pod Piratem, which, for a change, has a somewhat marine atmosphere.